This week's Kitchen Parade column is an ode to fall food. Color comes late to eastern Missouri: just now the leaves are beginning to turn. 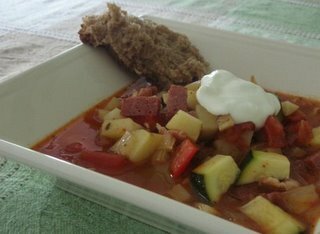 So it's time to savor the light, the color, the cool air ... then sit down to a bowl of rustic, rib-sticking Balkan sausage stew.